Late last year, Ewan found he was having difficulty focusing on anything. “Whenever I tried to read or look someone in the face, I had the sensation of having some grease in my eye; everything was a bit blurred but rubbing my eyes didn’t really help. I just put it down to being middle aged and needing new glasses,” he says. Over the next couple of weeks, the problem didn’t go away and one morning, Ewan got out of bed and realised that he could hardly see anything out of his right eye. “I was nearly hysterical. My wife had gone out early shopping, because it was Saturday and our son was getting married – she spent ages looking for a suitable outfit. I was panic stricken and eventually found my mobile to call her and she rushed home. By the time she arrived, I had got dressed and phoned the emergency doctor service, who advised I went to casualty,” he remembers. The casualty doctor who examined Ewan told him that his blood pressure was quite high and that he could have developed a blockage in the vein that drains blood from the retina in his right eye. “By this time, my sight had started to come back, but I had a central, very hazy spot in my vision and my head was aching like mad. That could have just been the stress, but I was convinced I could have a stroke any minute and die,” says Ewan. Nothing much could be done at the weekend, so Ewan had to go home with instructions to take low doses of aspirin each day until his appointment the following Thursday. The eye specialist who saw Ewan did various tests, including an eye angiogram to see how the blood supply to the back of his retina was doing and to see if the eye had sustained any damage. “The angiogram showed I had an occlusion in one branch off the main retinal vein – not in the main trunk of the vein itself, so the problem was located in one half of my retina only. Unfortunately, my macula, the central portion of the retina that is responsible for the finest visual acuity was affected, which is why my eyesight had deteriorated so rapidly,” explains Ewan. A few weeks later, Ewan went back to the hospital as a day case to have laser treatment for his retinal vein occlusion. 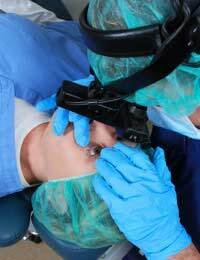 The procedure is done to seal the leaks of fluid that can lead to swelling and inflammation in the retina, and to stop the growth of new blood vessels. “The eye tries to compensate for the blockage by growing new blood vessels to go around the problem – but the trouble is these new blood vessels form randomly and can grow through the retina, totally destroying all the tissue that you use to see,” reports Ewan. The laser eye treatment required Ewan to have a mild sedative but not a general anaesthetic and he was allowed to go home later in the day. “It wasn’t painful at all, just uncomfortable having to lie as still as possible for what seemed like an age. The laser was used very precisely in a grid formation across the back of my retina to seal as much of the new blood vessels off as possible and to prevent more fluid leaking out,” he says. After resting for a few days, Ewan resumed his new activities. “After going to my GP in between the visit to casualty and my laser treatment, I was told in no uncertain terms that I needed to change my lifestyle to protect my sight. High blood pressure is one of the main risk factors for retinal vein occlusion and if I did something now, I might prevent the same problem happening in my other eye. I only needed to be told once...” says Ewan. Ewan and his wife sat down with a dietician and worked out a new diet plan for them both that would allow Ewan to reduce his weight over the next few months so that his BMI was within a normal range, and to up his intake of fresh fruits and vegetables. “I was about 2 stones overweight and I was eating too much fat and salt. It’s now been 5 months and I have lost one and a half stones, I feel much better and my blood pressure is lower than it was. I’m not there yet, but at least this was a wake-up call that I haven’t ignored,” he says.